The Ram 3500 is 4-ton heavy-duty ute which can tow up to 31, 200 pounds and has payload limit of 7, 390 pounds. The model delivers proven capability and durability but can also be configured with premium luxury features and advanced technology. It covers a wide range of options where you can choose between, three cab styles, two bed lengths, six trim levels and three powertrains. It also comes with single or dual rear wheel configuration. The 2017 Ram 3500 Laramie Longhorn is its version that sits bellow the top Laramie Limited version. Let’s see what this model has to offer. The Laramie Limited trim is available with the Crew Cab and Mega Cab body styles. Both Cab versions come with four doors. The Crew Cab is available with both long 8-foot bed and short 6.4-foot option. The Mega Cab comes with short bed only and offers the most spacious interior. Three powertrain options are also available with this model. There is also a choice between single- or dual-rear-wheel configurations. 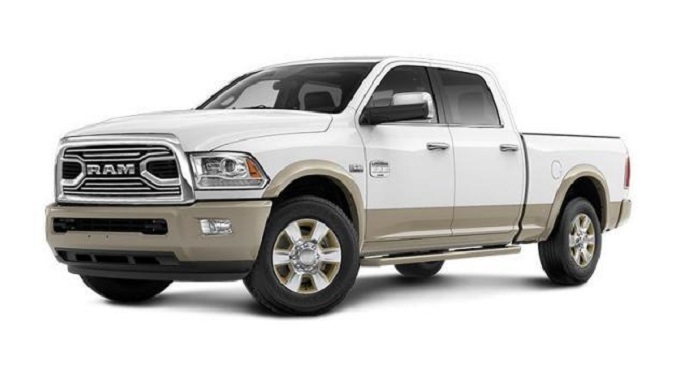 2017 Ram 3500 Laramie Longhorn features instantly recognizable Ram’s identity. Confident and tough appearance includes brand’s forward-leaning grille and bold body lines which stand out every Ram’s truck from others. On the other hand, this version features some unique details. It doesn’t feature signature crosshair grille yet it bears chrome grille with chrome insert. It also includes automatic quad beam headlights and fog lights. There are also premium LED taillights with chrome surround. The model also features white gold metallic bumpers and running boards. Other exterior features are chrome door handles, unique 18-inch aluminum wheels, two-tone lower body paint, spray-in bedliner, power-folding and heated mirrors with memory, etc. Inside the cabin, the model has woodgrain accentuated design. The interior also features premium leather upholstery and a full center console. The front bucket seats come with heating and ventilating functionality. The rear seats are heated and have 60/40 split-folding mechanism. The model also has 10-way power adjustable driver’s seat and 6-way passenger’s seat. There are also dual-zone automatic temperature control, power pedals, an overhead console, floor carpeting, in-floor storage compartments, etc. Techwise, the model includes an 8.4 center screen Uconnect interface and navigation. This system also provides smartphone integration, 10 speakers, HD and satellite radio, WiFi, emergency assistance, etc. There is also a 7-inch customizable center information display. For the safety and security of passengers, the model includes anti-lock disk brakes, stability and traction control, parking sensors, hill start assist, trailer sway control, tire pressure monitoring, rearview cameras, cargo-area camera, etc. When it comes to powertrains, the 2017 Ram 3500 Laramie Longhorn can be equipped with three engine options. It can also be configured with either rear- or four-wheel drive. There are also two transmission options, a six-speed automatic and heavy-duty Aisin automatic. The standard engine is a 5.7 liter HEMI V-8. It can produce 383 hp and torque of 400 pound-feet. This engine comes with a six-speed automatic transmission. With this engine, this truck allows up to 13, 910 pounds of towing capacity while it can haul 4, 480 pounds. The next engine option is a 6.4 liter HEMI V-8. It is good for 410 hp and torque of 429 lb-ft. The towing and hauling limits are 16, 520 and 7, 390 pounds respectively. There is also a 6.4 liter Cummins turbodiesel engine. It comes with a six-speed transmission and in that case produces 370 hp and 800 lb-ft of torque. However, with a heavy-duty Aisin transmission, it can reach the power of 385 hp and impressive torque of 900 lb-ft. In this configuration, it is towing champ with 31, 210 pounds. The price of the 2017 Ram 3500 Laramie Longhorn has the starting point from $62, 245.